I didn't write this, it came directly from the Pebble Beach Concours Team. The Concours raised $1.8 million for charity. The Monterey Car Week is an incredibly important time for the Monterey Peninsula. It's never too early to make your plans for next year. We are deeply thankful to all of you who helped to make the 2018 Pebble Beach Concours d'Elegance yet another unforgettable and historic event! The Pebble Beach Concours gathered 209 cars from 17 countries and 31 states on the 18th fairway of Pebble Beach Golf Links. This year, the Concours also raised an incredible $1.8 million for charity. Through the Pebble Beach Company Foundation, the primary charitable partner of the Concours, these funds will benefit over 80 local charities, impacting the lives of more than 10,000 children annually in Monterey County. 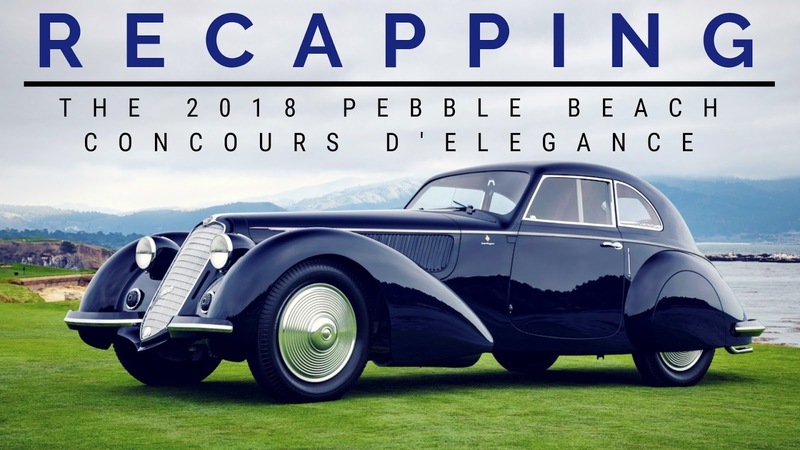 In this newsletter you will find coverage of many of the features at the Concours—from the exquisit Motor Cars of the Raj, to rare Rollston Coachwork, to the Maserati-brothers' OSCA marque, Postwar Custom Citroën, Tucker, Dream Convertibles of the Eisenhower Era, Scarabs, and Hong-Qi automobiles from China. You will also find video highlights of our 21st Pebble Beach Tour d'Elegance presented by Rolex, as well as the 2018 Dawn Patrol presented by Hagerty. We hope to see you next year, on August 18, 2019. As a reminder: next year's event will go back to its regular schedule, taking place on the third Sunday of August.